As you may have noticed, I have been messing around with python quite a bit lately. I remember trying it out back in college and using it on few small projects and then abandoning it for a while. Then I started working with Google App engine (back when it was Python only) and I got sucked into it once again. Since then it has become one of my go-to languages. In fact I’m amazed how the language grew up and matured since I first heard about it. So I figured I might as well devote a post to neat little tricks and quirks of this language. 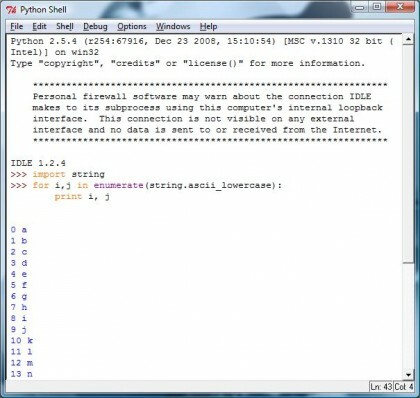 It does everything a regular interactive python shell would do, but it offers a number of improvements such as syntax highlighting and easier code editing. Basically when you start typing in a block of code such as a function or a conditional IDLE evaluates it only after you are done – not line by line like the regular shell. This allows you to use the up arrow and for example fix the previous line in the block before the whole thing is evaluated. Also since the shell runs inside a text-editor like environment, it makes it much easier to copy and paste lines of code between you text editor and your shell. It’s a great little tool. Use it. Same result, cleaner code. This function is there because the scenario in which you iterate over a list, while maintaining an index number is incredibly common. Here is another very common scenario: check if any element of the list is true. Or, better yet, check if all of them are true. There are two functions out there that do just that. Any returns true if at least one element in the list is true. All returns if all are true. This will usually save you a loop or two. This is the alternate syntax of if/else block that turns it into one liner. You put the results on opposite ends, and stick the test inside if/else keywords as shown above. This syntax has many applications but I find it’s greatest impact is on lambda functions. The function above takes two arguments: a value and a list, and then appends that argument to that list. If no list is passed as an argument, it ought to use an empty one. Only that it does not. The optional blank list is actually initialized once when the function is called without the second argument for the first time. Subsequent calls will reuse that same list – which is probably not the intended effect of that code. class Foo: @classmethod def a_class_method(self): print "OH HAI THAR! I'm " + self @staticmethod def a_static_method(): print "Some stuff"
Class methods know which class they belong to – they take the class reference as the first argument. Static methods do no such thing – they do not take an argument. As usual, I’m putting these things here mostly for my own reference. This way I can find these things in a few months after I completely forgot about them. But I found that frequently other people find these posts just as useful. So there you go. This entry was posted in programming and tagged python. Bookmark the permalink. You might want to check out DreamPie, it’s a nice graphical python shell i stumbled upon a while ago.